Every business needs a video marketing plan. But, what does a business do once they’ve accepted they need video? First, they place a video on their website’s landing page. 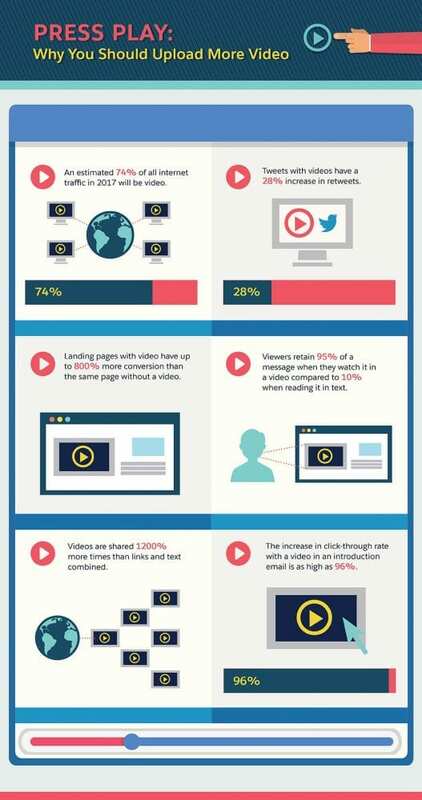 Landing pages with videos have up to 800% more conversions than landing pages without video. Next, all e-mail marketing must include video as an introductory measure. This gesture increases click-through rate by 96%. Next, comes addressing your social media presence. A business must acknowledge that all facets of their online identity are available within seconds to consumers. Your videos should be uniform within purpose across all avenues. Start on social media by including a video in your Facebook page’s about box. Today’s share comes from Salesforce. While the infographic covers a lot of information that Autodemo likes to reiterate to clients, it also offers a fresh take on how to move into exciting new areas. Video can be incorporated as a series of testimonials for your landing page and social media outlets. While they’re not meant to overshadow a CTA, they offer a fresh review avenue to better increase conversions. Videos are shared 1200% more times than video and text combined. As your business views the infographic, think of what these tips for social media and your website have to offer beyond these traditional venues. In the world of video marketing, there are more than 7 ways to better your business plan. Let this be the start of fantastic things for your products & services.